A housekeeper is an individual responsible for the supervision of a house's cleaning staff. In the great houses of the eighteenth, nineteenth and early twentieth centuries, the housekeeper could be a woman of considerable power in the domestic arena. The housekeeper of times past had her room (or rooms) cleaned by junior staff, her meals prepared and laundry taken care of, and with the butler presided over dinner in the Servants' Hall. Unlike most other servants, she was addressed as Mrs regardless of her marital status. Today's head of household staff in a great house lives in much the same manner, although fewer households can afford large retinues of servants with an elaborate hierarchy. In some countries this is due to the minimum wage. The housekeeper is generally hired by and reports to the lady of the house. The extent to which the housekeeper supervises other staff varies from household to household. 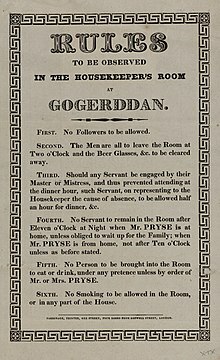 In general, the staff of a grand dwelling is divided into departments, with the housekeeper in charge of all the female staff with the possible exception of the kitchen staff, who report to the cook, and the between staff, who may report to the butler; in these cases the cook and butler reported directly to the lady of the house. In other households, particularly those of the very wealthy who maintain several residences, the housekeeper is the ultimate head of household staff and may hire and/or fire junior staff, subject to the approval of the lady of the house, and make recommendations for senior staff. In this case, the cook and butler report to the lady of the house through the housekeeper. In developed countries, fewer families can afford live-in help as they once did. Fewer hereditary grand households exist due to the World Wars, though a considerable number do exist in places such as the United Kingdom of Great Britain and Northern Ireland. Fewer families employ staff due to advances in technology and the lack of need due to social status. In nations where there is still a ready supply of inexpensive labour, the middle classes may still be able to afford servants. For these households, the remnant of the once grand position of head housekeeper is often a cook-housekeeper. The modern cook-housekeeper performs cooking and cleaning duties. In countries such as the United States of America, the United Kingdom of Great Britain and Northern Ireland, France and the European countries, there has been a rise in people employing domestic staff.